Turbo-BrainVoyager (TBV) is a highly optimized software package for real-time analysis and advanced visualization of functional and structural magnetic resonance imaging data sets. Turbo-BrainVoyager allows quality assurance of ongoing fMRI measurements by assessing head motion and by incrementally computing statistical maps as contrasts of a General Linear Model (GLM). Statistical information can be visualized on original slices (multi-slice view as well as in orthographic 3D mode using anatomical scans of the subject. If anatomical data sets of the subject are prepared with BrainVoyager QX prior to the real-time functional measurement, statistical information can be viewed in Talairach space as well as on surface (mesh) representations. TBV allows to select regions-of-interest (ROIs) from any brain view and plots time courses, estimated beta values and event-related averages dynamically. TBV also allows to use machine learning tools to classify and predict distributed patterns of activity ("brain reading"). Due to its computational and visualization capabilities, TBV supports advanced real-time applications such as neurofeedback, brain computer interfaces (BCIs), adaptive experimental designs and neurosurgical monitoring. Special routines for full-fledged incremental statistical data analysis (recursive least squares GLM) of block- and event-related designs. Optimized routines for multi-voxel pattern classification (MVPC) using support vector machines (SVMs). Incremental preprocessing routines including 3D motion correction, 3D spatial smoothing and drift correction based on confound predictors; additional steps such as slice scan time correction can be performed at the end of a run. Easy to use graphical user interface (GUI) with essential elements to control online and offline analysis. Design matrices, contrasts and other relevant statistical data are created automatically from a defined protocol. Instead of a complete protocol, real-time protocols may be used to build up the design matrix on the fly during scanning. Interactive GUI that allows to explore incoming data while running the actual measurement, including selection of multiple contrasts as well as selection of conjunction of contrasts. Inspection of ROI data at any time in automatically detrended time course plots, event-related averaging plots and dynamically estimated beta values. Advanced volume and surface visualizations with fast statistical updates ("movie") by using transformation matrices to project calculated statistical data from/to original image space. Incorporation of Volumes-Of-Interests (VOIs) in Talairach space to (re-)load ROIs. Integrated neurofeedback module to display data to subject and to save ROI data incrementally for use with custom programs. Integrated letter spelling BCI tool (BOLD Decoder). Storage of fMRI raw data on local hard drive in BrainVoyager format after functional run has been completed allowing an easy transition to in-depth data analysis with BrainVoyager QX or other fMRI software packages. A powerful plugin interface that supports integration of custom computations during real-time processing; the plugin interface has access to raw and preprocessed data, to ROIs and statistical maps that can be processed or exported incrementally to disk. Support for real-time ICA analysis implemented as a plugin using the plugin map visualization functions. Previously recorded runs can also be reloaded and inspected at any time. Turbo-BrainVoyager is optimized for real-time analysis and is not a replacement for BrainVoyager QX or other offline software. There are, for example, no routines for head and cortex segmentation, Talairach transformation and statistical group analyses. Some of the advanced visualization features require anatomical processing (e.g. Talairach transformation, surface mesh creation) in BrainVoyager QX prior to real-time analysis in TBV. 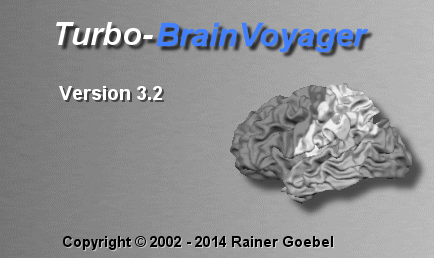 Turbo-BrainVoyager 3.2 runs on Microsoft Windows 7/8, Linux (2.6+ kernel), and Mac OS X 10.7/10.8/10.9. The next section provides information how to setup TBV in a scanner network environment and how to prepare neurofeedback experiments. This is followed by an overview of how to use TBV followed by in-depth descriptions of its major features. If you are new to Turbo-BrainVoyager, you may also want to run the provided sample data sets.to make yourself familar with the software. It is also recommended to have a look at the release notes describing features added in this and previous versions.